For the last couple of weeks, my friend Alex has been hosting small casual dinners at her lofty dorm in the East Village during the school week for a few of our close friends. Dinner with friends is one of my favorite ways to unwind after a busy week. Maybe because we are Californian girls and missing our burritos, we have been making lots of rice paper vegan wraps lately. I love these because you can nosh on them all night long, and they are not only delicious but healthy. Wraps are a great to share with friends because they are easy to make and customizable to everyone’s tastes. 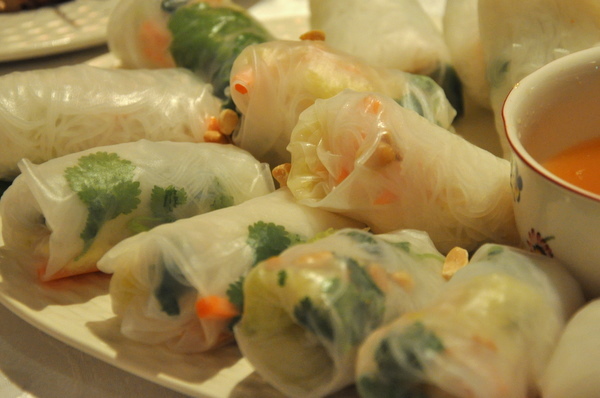 The best part about wraps is you can be creative–starting with rice paper, you can literally fill them with anything. We started out with a peanut sauce, almond butter, or hummus, and piled on avocados, roasted squash, red cabbage, pickled carrots, cucumbers, and radishes, topping the wraps off with parsley, cilantro or chili flakes. Anything goes–the more colorful and creative, the better. With the cooking limited to just roasting the squash or other vegetables and prepping includes only slicing vegetables, vegan wraps are extremely easy for a busy weekday night and even can be made in the dorm rooms not equipped with kitchens. Wash down the wraps with a raspberry hard cider, a soda-like drink with a low alcohol content, providing the perfect weeknight buzz while hanging with friends. Even though the weeknights can be busy, vegan wraps are a great light dinner to easily and quickly make with friends, leaving more time for gossiping as well as writing papers.